I was lucky enough to see Last Girl Standing at this years Eerie Horror Film Fest in Erie, PA. The film pitches a unique idea that instantly interested me: what happens to the final girl after the horror movie ends? The idea has been explored before in sequels such as Friday the 13th, Part 2, where Adrienne King's Alice gets killed, Neve Campbell throughout the never ending twists and turns of the Scream series, and countless others like that. But what would happen in the real world to somebody who survived a killer straight out of a slasher movie? Last Girl Standing focuses on the life of Camryn (Akasha Villalobos), the only survivor of a brutal massacre during a camping trip with some friends only to still be haunted five years later by the terrible memory and image of the killer. The killer wore an animal head with horns over his own in a sadistic manner and it was truly a disturbing sight! For a killer who is only on screen for about 5 minutes (he gets killed), the filmmakers did a good job in making him memorable. Camryn has been living a quiet life in an apartment that looks like she hasn't finished moving into and working at a dry cleaners since the incident happened. Actress Akasha Villalobos does a stellar job in portraying the paralyzed stillness and tortured silence that Camryn's life has become. There are scenes that show her brushing her teeth when she will suddenly stop and look at her closed shower curtain as a heavy breathing fills the bathroom, unexpectedly back in the grip of the killer. These are powerful moments that are very effective and show the sudden dread that can take over her life at any moment. She may not have died that night in the woods, but her life stopped and Villalobos superbly encompasses this feeling in her performance. When a new employee gets hired at the dry cleaners, Nick (Brian Villalobos), the visions Camryn has of the killer start to intensify. This is in conjunction with the 5 year anniversary of the killings and Camryn seems to not trust the new employee. Late one night a break in happens at the dry cleaner when Camryn is there alone and she sees glimpses of the killer and swears he is after her again. When the cops come, they advise her not to be alone and, having no where else to go, Nick offers his place where Camryn meets his roommates. The film takes it's time as Camryn establishes relationships with these people and seemingly makes friends with most in the group. Although her visions of the killer resume as well as the belief that he is after her, she appears to have a support system with these new friends in place to help her. While the group question her believability and sanity, it is clear that something is following Camryn, they just aren't sure what. The pacing of the film is slow and really takes it's time to build up to it's final act. Don't get me wrong here, the slow burn approach is very effective and serves a purpose as it strongly establishes the necessary relationships that come in to play later in the film. After being immersed in the world and characters of the film, the viewer's patience is more than rewarded with a brilliantly set up ending full of chaotic slasher goodness! It's pacing reminded me of another brilliant independent horror gem from the past year called Pieces of Talent. Last Girl Standing is a character study of the idea of 'The Final Girl' and what realistic effect such a label from a horrible situation could potentially have on a person. It's a smart horror film with great production value and strong performances from the whole cast. 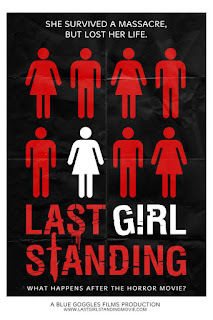 Last Girl Standing is on the festival circuit as of this writing and if you get the chance to see it do not pass it up, it will be the movie you are talking about when you leave.